Children need time to explore, create and play independently – as long as it in a safe environment. Use these general summer safety tips, go over them with your kids, then let them have a little fun. Sunscreen isn’t just for sweltering, sunny days; there are harmful UV rays lurking about on cloudy days, too. Use a minimum of SPF 15, but don’t go too crazy – stick to a maximum of SPF 60. It is easy to miss spots if you are using a spray sunscreen, so be sure to spray every area of exposed skin. Use lotion on the face rather than spray to avoid inhalation of the sunscreen. Use water-resistant sunscreen and reapply after water activities. It’s always important to drink plenty of water, but this is even truer during the summer months. Before you head to the park, or even the backyard, pre-hydrate. Gather the family and toast with a big glass of cold water. Keep water bottles with you on hikes and bike rides, and offer fruit as snacks through the day. After high-energy activities like soccer or even swimming, rehydrate. According to redcross.ca, you should establish a set of pool rules, even for your own backyard. Rules can include swimming with a buddy, entering the water feet first, keeping the pool deck clear of toys and debris, and, of course, always having an adult present. Those are just a few to start. For full water safety rules, visit redcross.ca. Remember that kids should not be left unattended in a pool area, even for a moment. A proper helmet is needed for biking, scooting, rollerblading or skateboarding. Be sure that your child’s helmet is certified by the Canadian Standards Association or the Consumer Product Safety Commission and fits properly. It should not fall over the ears or eyes. Chances are, your kiddo will need a new helmet each year to achieve that perfect fit. Skip the used helmets. A second-hand helmet may be old and damaged. Sure it’s nice to save a few bucks, but it’s better to be safe. 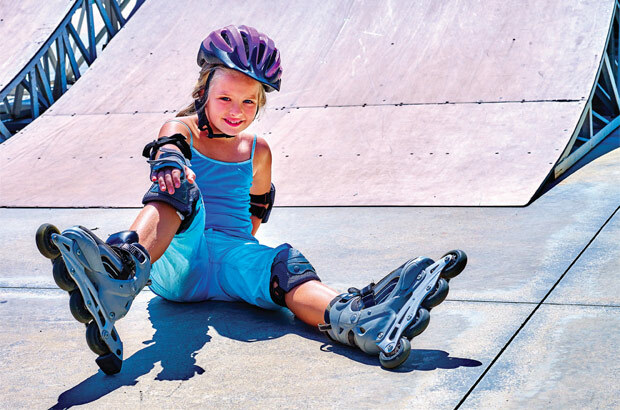 Don’t forget the kneepads, elbow pads, wrist guards and gloves – particularly for rookie two-wheel riders and skateboarders. Mother nature can get pretty crazy in the summer, so show her some respect. Rainstorms can be fun to splash around in, but avoid being outdoors as soon as you see lightning – especially when in the pool, on a lake, on a baseball field or on a golf course. Rivers, lakes and creeks can become very dangerous during heavy rain, with strong currents and flooding. Even “expert” swimmers should avoid all bodies of water during a storm. Keep a fully-stocked first aid kit in your home. Take it with you camping or cottaging, and create smaller versions to keep in the car or to carry on hikes. Here’s what you need, according to the Canadian Red Cross.